Six months ago I experimented with Web sockets for WebRTC and the early implementations of PeerConnection in Chrome. Last week I gave a presentation about WebRTC at Linux.conf.au, so it was time to update that codebase. Then I turned to the client code. I was surprised to see the massive changes that PeerConnection has gone through. Check out my slide deck to see the different components that are now necessary to create a PeerConnection. I was also surprised by the need to use ICE, even though in my experiment I got away with an empty list of ICE servers – the ICE messages just got exchanged through the socket.io server. I am not sure whether this is a bug, but I was very happy about it because it meant I could run the whole demo on a completely separate network from the Internet. The most exciting news since my talk is that Mozilla and Google have managed to get a PeerConnection working between Firefox and Chrome – this is the first cross-browser video conference call without a plugin! The code differences are minor. and the peer-to-peer data API. The best places to learn about the latest possibilities of WebRTC are webrtc.org and the W3C WebRTC WG. code.google.com has open source code that continues to be updated to the latest released and interoperable features in browsers. The video of my talk is in the process of being published. There is a MP4 version on the Linux Australia mirror server, but I expect it will be published properly soon. I will update the blog post when that happens. A bit over a week ago I gave a presentation at Web Directions Code 2012 in Melbourne. Maxine and John asked me to speak about something related to HTML5 video, so I went for the new shiny: WebRTC – real-time communication in the browser. I only had 20 min, so I had to make it tight. I wanted to show off video conferencing without special plugins in Google Chrome in just a few lines of code, as is the promise of WebRTC. To a large extent, I achieved this. But I made some interesting discoveries along the way. Demos are in the slide deck. UPDATE: Opera 12 has been released with WebRTC support. Housekeeping: if you want to replicate what I have done, you need to install a Google Chrome Web Browser 19+. Then make sure you go to chrome://flags and activate the MediaStream and PeerConnection experiment(s). Restart your browser and now you can experiment with this feature. Big warning up-front: it’s not production-ready, since there are still changes happening to the spec and there is no compatible implementation by another browser yet. Set up a video element each for the local and the remote video stream. Grab the local camera and stream it to the first video element. (*) Establish a connection to another person running the same Web page. Send the local camera stream on that peer connection. Accept the remote camera stream into the second video element. Now, the most difficult part of all of this – believe it or not – is the signalling part that is required to build the peer connection (marked with (*)). Initially I wanted to run completely without a server and just enter the remote’s IP address to establish the connection. This is, however, not a functionality that the PeerConnection object provides [might this be something to add to the spec?]. So, you need a server known to both parties that can provide for the handshake to set up the connection. All the examples that I have seen, such as https://apprtc.appspot.com/, use a channel management server on Google’s appengine. I wanted it all working with HTML5 technology, so I decided to use a Web Socket server instead. I implemented my Web Socket server using node.js (code of websocket server). The video conferencing demo is in the slide deck in an iframe – you can also use the stand-alone html page. Works like a treat. I’m not running a public WebSocket server, so you won’t be able to see this part of the presentation working. But the local loopback video should work. At the conference, it all went without a hitch (while the wireless played along). I believe you have to host the WebSocket server on the same machine as the Web page, otherwise it won’t work for security reasons. A whole new world of opportunities lies out there when we get the ability to set up video conferencing on every Web page – scary and exciting at the same time! In January I attended the annual Australian Linux and Open Source conference (LCA). But since I was sick all of January and had a lot to catch up on, I never got around to sharing all the talks that I gave during that time. It started with a talk at Drupal Down Under, which happened the weekend before LCA. I gave a talk titled “HTML5 video specifications” (video, slides). On the first day of LCA I gave a talk both in the Multimedia Miniconf and the Browser Miniconf. In the Browser Miniconf I talked about “Web Standardisation – how browser vendors collaborate, or not” (slides). Maybe the most interesting part about this was that I tried out a new slide “deck” tool called impress.js. I’m not yet sure if I like it but it worked well for this talk, in which I explained how the HTML5 spec is authored and who has input. I also sat on a panel of browser developers in the Browser Miniconf (more as a standards than as a browser developer, but that’s close enough). We were asked about all kinds of latest developments in HTML5, CSS3, and media standards in the browser. In the Multimedia Miniconf I gave a “HTML5 media accessibility update” (slides). I talked about the accessibility problems of Flash, how native HTML5 video players will be better, about accessible video controls, captions, navigation chapters, audio descriptions, and WebVTT. I also provided a demo of how to synchronize multiple video elements using a polyfill for the multitrack API. I also provided an update on HTTP adaptive streaming APIs as a lightning talk in the Multimedia Miniconf. I used an extract of the Drupal conference slides for it. Finally, and most importantly, Alice Boxhall and myself gave a talk in the main linux.conf.au titled “Developing Accessible Web Apps – how hard can it be?” (video, slides). I spoke about a process that you can follow to make your Web applications accessible. I’m writing a separate blog post to explain this in more detail. In her part, Alice dug below the surface of browsers to explain how the accessibility markup that Web developers provide is transformed into data structures that are handed to accessibility technologies. The Open Video Conference that took place on 10-12 September was so overwhelming, I’ve still not been able to catch my breath! It was a dense three days for me, even though I only focused on the technology sessions of the conference and utterly missed out on all the policy and content discussions. To provide a summary of all the discussions would be impossible, so I just want to share the key take-aways that I had from the main sessions. Tim Terriberry (Mozilla), Serge Lachapelle (Google) and Ethan Hugg (CISCO) moderated this session together (slides). There are activities both at the W3C and at IETF – the ones at IETF are supposed to focus on protocols, while the W3C ones on HTML5 extensions. The current proposal of a PeerConnection API has been implemented in WebKit/Chrome as open source. It is expected that Firefox will have an add-on by Q1 next year. It enables video conferencing, including media capture, media encoding, signal processing (echo cancellation etc), secure transmission, and a data stream exchange. Current discussions are around the signalling protocol and whether SIP needs to be required by the standard. Further, the codec question is under discussion with a question whether to mandate VP8 and Opus, since transcoding gateways are not desirable. Another question is how to measure the quality of the connection and how to report errors so as to allow adaptation. What always amazes me around RTC is the sheer number of specialised protocols that seem to be required to implement this. WebRTC does not disappoint: in fact, the question was asked whether there could be a lighter alternative than to re-use dozens of years of protocol development – is it over-engineered? Can desktop players connect to a WebRTC session? We are already in a second or third revision of this part of the HTML5 specification and yet it seems the requirements are still being collected. I’m quietly confident that everything is done to make the lives of the Web developer easier, but it sure looks like a huge task. Zohar Babin (Kaltura) and myself moderated this session and I must admit that this session was the biggest eye-opener for me amongst all the sessions. There was a large number of Flash developers present in the room and that was great, because sometimes we just don’t listen enough to lessons learnt in the past. This session gave me one of those aha-moments: it the form of the Flash appendBytes() API function. This totally blew my mind and I am now completely supportive of having such a function in HTML5. Together with media fragment URIs you could even leave all the header download management for resources to the Web browser and just request time ranges from a video through an appendBytes() function. This would be easier on the Web developer than having to deal with byte ranges and making sure that appropriate decoding pipelines are set up. Philip Jagenstedt (Opera) and myself moderated this session. We focused on the HTML5 track element and the WebVTT file format. Many issues were identified that will still require work. One particular topic was to find a standard means of rendering the UI for caption, subtitle, und description selection. For example, what icons should be used to indicate that subtitles or captions are available. While this is not part of the HTML5 specification, it’s still important to get this right across browsers since otherwise users will get confused with diverging interfaces. Chaptering was discussed and a particular need to allow URLs to directly point at chapters was expressed. I suggested the use of named Media Fragment URLs. The use of WebVTT for descriptions for the blind was also discussed. A suggestion was made to use the voice tag <v> to allow for “styling” (i.e. selection) of the screen reader voice. Finally, multitrack audio or video resources were also discussed and the @mediagroup attribute was explained. A question about how to identify the language used in different alternative dubs was asked. This is an issue because @srclang is not on audio or video, only on text, so it’s a missing feature for the multitrack API. Beyond this session, there was also a breakout session on WebVTT and the track element. As a consequence, a number of bugs were registered in the W3C bug tracker. This session was moderated by John Luther and John Koleszar, both of the WebM Project. They started off with a presentation on current work on WebM, which includes quality testing and improvements, and encoder speed improvement. Then they moved on to questions about how to involve the community more. The community criticised that communication of what is happening around WebM is very scarce. More sharing of information was requested, including a move to using open Google+ hangouts instead of Google internal video conferences. More use of the public bug tracker can also help include the community better. Another pain point of the community was that code is introduced and removed without much feedback. It was requested to introduce a peer review process. Also it was requested that example code snippets are published when new features are announced so others can replicate the claims. This all indicates to me that the WebM project is increasingly more open, but that there is still a lot to learn. This session was moderated by Frank Galligan and Aaron Colwell (Google), and Mark Watson (Netflix). Mark started off by giving us an introduction to MPEG DASH, the MPEG file format for HTTP adaptive streaming. MPEG has just finalized the format and he was able to show us some examples. DASH is XML-based and thus rather verbose. It is covering all eventualities of what parameters could be switched during transmissions, which makes it very broad. These include trick modes e.g. for fast forwarding, 3D, multi-view and multitrack content. MPEG have defined profiles – one for live streaming which requires chunking of the files on the server, and one for on-demand which requires keyframe alignment of the files. There are clear specifications for how to do these with MPEG. Such profiles would need to be created for WebM and Ogg Theora, too, to make DASH universally applicable. Further, the Web case needs a more restrictive adaptation approach, since the video element’s API is already accounting for some of the features that DASH provides for desktop applications. So, a Web-specific profile of DASH would be required. Then Aaron introduced us to the MediaSource API and in particular the webkitSourceAppend() extension that he has been experimenting with. It is essentially an implementation of the appendBytes() function of Flash, which the Web developers had been asking for just a few sessions earlier. This was likely the biggest announcement of OVC, alas a quiet and technically-focused one. Aaron explained that he had been trying to find a way to implement HTTP adaptive streaming into WebKit in a way in which it could be standardised. While doing so, he also came across other requirements around such chunked video handling, in particular around dynamic ad insertion, live streaming, DVR functionality (fast forward), constraint video editing, and mashups. While trying to sort out all these requirements, it became clear that it would be very difficult to implement strategies for stream switching, buffering and delivery of video chunks into the browser when so many different and likely contradictory requirements exist. Also, once an approach is implemented and specified for the browser, it becomes very difficult to innovate on it. Instead, the easiest way to solve it right now and learn about what would be necessary to implement into the browser would be to actually allow Web developers to queue up a chunk of encoded video into a video element for decoding and display. Thus, the webkitSourceAppend() function was born (specification). // URL passed to src attribute to enable the media source logic. // end of stream status codes. The code is already checked into WebKit, but commented out behind a command-line compiler flag. Frank then stepped forward to show how webkitSourceAppend() can be used to implement HTTP adaptive streaming. His example uses WebM – there are no examples with MPEG or Ogg yet. The chunks that Frank’s demo used were 150 video frames long (6.25s) and 5s long audio. Stream switching only switched video, since audio data is much lower bandwidth and more important to retain at high quality. Switching was done on multiplexed files. Every chunk requires an XHR range request – this could be optimised if the connections were kept open per adaptation. Seeking works, too, but since decoding requires download of a whole chunk, seeking latency is determined by the time it takes to download and decode that chunk. Similar to DASH, when using this approach for live streaming, the server has to produce one file per chunk, since byte range requests are not possible on a continuously growing file. Frank did not use DASH as the manifest format for his HTTP adaptive streaming demo, but instead used a hacked-up custom XML format. It would be possible to use JSON or any other format, too. After this session, I was actually completely blown away by the possibilities that such a simple API extension allows. If I wasn’t sold on the idea of a appendBytes() function in the earlier session, this one completely changed my mind. While I still believe we need to standardise a HTTP adaptive streaming file format that all browsers will support for all codecs, and I still believe that a native implementation for support of such a file format is necessary, I also believe that this approach of webkitSourceAppend() is what HTML needs – and maybe it needs it faster than native HTTP adaptive streaming support. In the end, it seemed that work previously done by Steve Lacey on a proposal for video metrics was generally acceptable, except for the playbackJitter metric, which may be too aggregate to mean much. I didn’t actually attend this session held by Anant Narayanan (Mozilla), but from what I heard, the discussion focused on how to manage permission of access to video camera, microphone and screen, e.g. when multiple applications (tabs) want access or when the same site wants access in a different session. This may apply to real-time communication with screen sharing, but also to photo sharing, video upload, or canvas access to devices e.g. for time lapse photography. This was another session that I wasn’t able to attend, but I believe the creation of good open source video editing software and similar video creation software is really crucial to giving video a broader user appeal. Jeff Fortin (PiTiVi) moderated this session and I was fascinated to later see his analysis of the lifecycle of open source video editors. It is shocking to see how many people/projects have tried to create an open source video editor and how many have stopped their project. It is likely that the creation of a video editor is such a complex challenge that it requires a larger and more committed open source project – single people will just run out of steam too quickly. 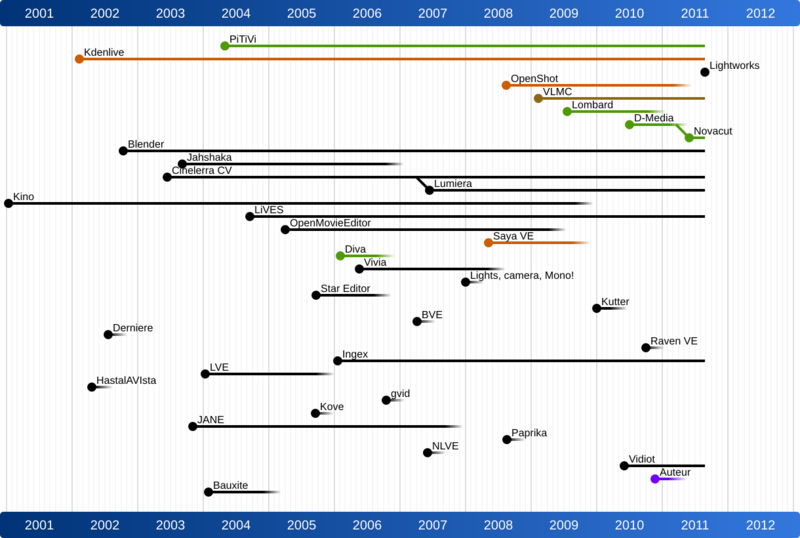 This may be comparable to the creation of a Web browser (see the size of the Mozilla project) or a text processing system (see the size of the OpenOffice project). Jeff also mentioned the need to create open video editor standards around playlist file formats etc. Possibly the Open Video Alliance could help. In any case, something has to be done in this space – maybe this would be a good topic to focus next year’s OVC on? The conference ended officially on Sunday night, but we had a third day of discussions / hackday at the wonderful New York Lawschool venue. We had collected issues of interest during the two previous days and organised the breakout groups on the morning (Schedule). In the Content Protection/DRM session, Mark Watson from Netflix explained how their API works and that they believe that all we need in browsers is a secure way to exchange keys and an indicator of protection scheme is used – the actual protection scheme would not be implemented by the browser, but be provided by the underlying system (media framework/operating system). I think that until somebody actually implements something in a browser fork and shows how this can be done, we won’t have much progress. In my understanding, we may also need to disable part of the video API for encrypted content, because otherwise you can always e.g. grab frames from the video element into canvas and save them from there. In the Playlists and Gapless Playback session, there was massive brainstorming about what new cool things can be done with the video element in browsers if playback between snippets can be made seamless. Further discussions were about a standard playlist file formats (such as XSPF, MRSS or M3U), media fragment URIs in playlists for mashups, and the need to expose track metadata for HTML5 media elements. What more can I say? It was an amazing three days and the complexity of problems that we’re dealing with is a tribute to how far HTML5 and open video has already come and exciting news for the kind of applications that will be possible (both professional and community) once we’ve solved the problems of today. It will be exciting to see what progress we will have made by next year’s conference. Thanks go to Google for sponsoring my trip to OVC. UPDATE: We actually have a mailing list for open media developers who are interested in these and similar topics – do join at http://lists.annodex.net/cgi-bin/mailman/listinfo/foms. Since 2007 I have organised the annual Foundations of Open Media Software (FOMS) developers workshop. Last year it was held for the first time in the northern hemisphere, in fact on the two days straight after the Open Video Conference (OVC). This year I’m really excited to announce that the workshop will be an integral part of the Open Video Conference on 10-12 September 2011. FOMS 2011 will take place as the Open Media Developers track at OVC and I would like to see as many if not more open media software developers attend as we had in last year’s FOMS. Well, firstly of course the people. As in previous years, we will have some of the key developers in open media software attend – not as celebrities, but to work with other key developers on hard problems and to make progress. I’m actually not quite satisfied with just these sessions. I’d like to be more flexible on how we make the three days a success for everyone. And this implies that there will continue to be room to add more sessions, even while at the conference, and create breakout groups to address really hard issues all the way through the conference. I insist on this flexibility because I have seen in past years that the most productive outcomes are created by two or three people breaking away from the group, going into a corner and hacking up some demos or solutions to hard problems and taking that momentum away after the workshop. To allow this to happen, we will have a plenary on the first day during which we will identify who is actually present at the workshop, what they are working on, what sessions they are planning on a attending, and what other topics they are keen to learn about during the conference that may not yet be addressed by existing sessions. We’ll repeat this exercise on the Monday after all the rest of the conference is finished and we get a quieter day to just focus on being productive. But is it worth the effort? As in the past years, whether the workshop is a success for you depends on you and you alone. You have the power to direct what sessions and breakout groups are being created, and you have the possibility to find others at the workshop that share an interest and drag them away for some productive brainstorming or coding. I’m going to make sure we have an adequate number of rooms available to actually achieve such an environment. I am very happy to have the support of OVC for this and I am assured we have the best location with plenty of space. As in previous FOMSes, we have again made sure that travel and conference sponsorship is available to community software developers that would otherwise not be able to attend FOMS. We have several such sponsorships and I encourage you to email the FOMS committee or OVC about it. Mention what you’re working on and what you’re interested to take away from OVC and we can give you free entry, hotel and flight sponsorship. Oh, and don’t forget to Register for OVC! At the recent Linux conference in Brisbane, Australia, I promised a free copy of my book to the person that could send me the best idea for an HTML5 video application. I later also tweeted about it. Develop a simple video cutting tool to, say setting cut points and having a very simple backend taking the cut points and generating quick enough output. The cutting doesn’t need to retranscode. Use HTML5 video, especially the tracking between video and text, to better present video from the NZ Parliament. Making a small MMO game using WebGL, HTML5 audio and WebSockets. I also want to use the same code for desktop and web. These are all awesome ideas and I found it really hard to decide whom to give the free book to. In the end, I decided to give it to Brian McKenna, who is working on the MMO game – simply because it it is really pushing the boundaries of several HTML5 technologies. To everyone else: the book is actually not that expensive to buy from APRESS or Amazon and you can get the eBook version there, too. Thanks to everyone who started really thinking about this and sent in a proposal! Working in the WHAT WG and the W3C HTML WG, you sometimes forget that all the things that are being discussed so heatedly for standardization are actually leading to some really exciting new technologies that not many outside have really taken note of yet. This week, during the Australian Linux Conference in Brisbane, I’ve been extremely lucky to be able to show off some awesome new features that browser vendors have implemented for the audio and video elements. The feedback that I got from people was uniformly plain surprise – nobody expected browser to have all these capabilities. The examples that I showed off have mostly been the result of working on a book for almost 9 months of the past year and writing lots of examples of what can be achieved with existing implementations and specifications. They have been inspired by diverse demos that people made in the last years, so the book is linking to many more and many more amazing demos. Incidentally, I promised to give a copy of the book away to the person with the best idea for a new Web application using HTML5 media. Since we ran out of time, please shoot me an email or a tweet (@silviapfeiffer) within the next 4 weeks and I will send another copy to the person with the best idea. The copy that I brought along was given to a student who wanted to use HTML5 video to display on surfaces of 3D moving objects. So, let’s get to the talks. On Monday, I gave a presentation on “Audio and Video processing in HTML5“, which had a strong focus on the Mozilla Audio API. I further gave a brief lightning talk about “HTML5 Media Accessibility Update“. I am expecting lots to happen on this topic during this year. Finally, I gave a presentation today on “The Latest and Coolest in HTML5 Media” with a strong focus on video, but also touching on audio and media accessibility. The talks were streamed live – congrats to Ryan Verner for getting this working with support from Ben Hutchings from DebConf and the rest of the video team. The videos will apparently be available from http://linuxconfau.blip.tv/ in the near future. On 14th October I gave a talk at Web Directions South on “HTML5 audio and video – using these exciting new elements in practice”. I wanted to give people an introduction into how to use these elements while at the same time stirring their imagination as to the design possibilities now that these elements are available natively in browsers. I re-used some of the demos that I have put together for the book that I am currently writing, added some of the cool stuff that others have done and finished off with an outlook towards what new features will probably arrive next. “Slides” are now available, which are really just a Web page with some demos that work in modern browsers. At this week’s FOMS in New York we had one over-arching topic that seemed to be of interest to every single participant: how to do adaptive bitrate streaming over HTTP for open codecs. On the first day, there was a general discussion about the advantages and disadvantages of adaptive HTTP streaming, while on the second day, we moved towards designing a solution for Ogg and WebM. While I didn’t attend all the discussions, I want to summarize the insights that I took out of the days in this blog post and the alternative implementation strategies that were came up with. Streaming using RTP/RTSP has in the past been the main protocol to provide live video streams, either for broadcast or for real-time communication. It has been purpose-built for chunked video delivery and has features that many customers want, such as the ability to encrypt the stream, to tell players not to store the data, and to monitor the performance of the stream such that its bandwidth can be adapted. It has, however, also many disadvantages, not least that it goes over ports that normal firewalls block and thus is rather difficult to deploy, but also that it requires special server software, a client that speaks the protocol, and has a signalling overhead on the transport layer for adapting the stream. RTP/RTSP has been invented to allow for high quality of service video consumption. In the last 10 years, however, it has become the norm to consume “canned” video (i.e. non-live video) over HTTP, making use of the byte-range request functionality of HTTP for seeking. While methods have been created to estimate the size of a pre-buffer before starting to play back in order to achieve continuous playback based on the bandwidth of your pipe at the beginning of downloading, not much can be done when one runs out of pre-buffer in the middle of playback or when the CPU on the machine doesn’t manage to catch up with decoding of the sheer amount of video data: your playback stops to go into re-buffering in the first case and starts to become choppy in the latter case. An obvious approach to improving this situation is the scale the bandwidth of the video stream down, potentially even switch to a lower resolution video, right in the middle of playback. Apple’s HTTP live streaming, Microsoft’s Smooth Streaming, and Adobe’s Dynamic Streaming are all solutions in this space. Also, ISO/MPEG is working on DASH (Dynamic Adaptive Streaming over HTTP) is an effort to standardize the approach for MPEG media. No solution yets exist for the open formats within Ogg or WebM containers. Enables adaptation of downloading to avoid continuing buffering when network or machine cannot cope. Gapless switching between streams of different bitrate. No special server software is required – any existing Web Server can be used to provide the streams. The adaptation comes from the media player that actually knows what quality the user experiences rather than the network layer that knows nothing about the performance of the computer, and can only tell about the performance of the network. Adaptation means that several versions of different bandwidth are made available on the server and the client switches between them based on knowledge it has about the video quality that the user experiences. Bandwidth is not wasted by downloading video data that is not being consumed by the user, but rather content is pulled moments just before it is required, which works both for the live and canned content case and is particularly useful for long-form content. In discussions at FOMS it was determined that mid-stream switching between different bitrate encoded audio files is possible. Just looking at the PCM domain, it requires stitching the waveform together at the switch-over point, but that is not a complex function. To be able to do that stitching with Vorbis-encoded files, there is no need for a overlap of data, because the encoded samples of the previous window in a different bitrate page can be used as input into the decoding of the current bitrate page, as long as the resulting PCM samples are stitched. For video, mid-stream switching to a different bitrate encoded stream is also acceptable, as long as the switch-over point adheres to a keyframe, which can be independently decoded. Thus, the preparation of the alternative bitstream videos requires temporal synchronisation of keyframes on video – the audio can deal with the switch-over at any point. A bit of intelligent encoding is thus necessary – requiring the encoding pipeline to provide regular keyframes at a certain rate would be sufficient. Then, the switch-over points are the keyframes. With the solutions from Adobe, Microsoft and Apple, the technology has been created such there are special tools on the server that prepare the content for adaptive HTTP streaming and provide a manifest of the prepared content. Typically, the content is encoded in versions of different bitrates and the bandwidth versions are broken into chunks that can be decoded independently. These chunks are synchronised between the different bitrate versions such that there are defined switch-over points. The switch-over points as well as the file names of the different chunks are documented inside a manifest file. It is this manifest file that the player downloads instead of the resource at the beginning of streaming. This manifest file informs the player of the available resources and enables it to orchestrate the correct URL requests to the server as it progresses through the resource. At FOMS, we took a step back from this approach and analysed what the general possibilities are for solving adaptive HTTP streaming. For example, it would be possible to not chunk the original media data, but instead perform range requests on the different bitrate versions of the resource. The following options were identified. With Chunking, the original bitrate versions are chunked into smaller full resources with defined switch-over points. This implies creation of a header on each one of the chunks and thus introduces overhead. Assuming we use 10sec chunks and 6kBytes per chunk, that results in 5kBit/sec extra overhead. After chunking the files this way, we provide a manifest file (similar to Apple’s m3u8 file, or the SMIL-based manifest file of Microsoft, or Adobe’s Flash Media Manifest file). The manifest file informs the client about the chunks and the switch-over points and the client requests those different resources at the switch-over points. Header overhead on the pipe. Switch-over delay for decoding the header. Possible problem with TCP slowstart on new files. A piece of software is necessary on server to prepare the chunked files. A large amount of files to manage on the server. The client has to hide the switching between full resources. Works for live streams, where increasing amounts of chunks are written. Works well with CDNs, because mid-stream switching to another server is easy. Chunks can be encoded such that there is no overlap in the data necessary on switch-over. May work well with Web sockets. Follows the way in which proprietary solutions are doing it, so may be easy to adopt. If the chunks are concatenated on the client, you get chained Ogg files (similar concept in WebM? ), which are planned to be supported by Web browsers and are thus legal files. Alternatively to creating the large number of files, one could also just create the chained files. Then, the switch-over is not between different files, but between different byte ranges. The headers still have to be read and parsed. And a manifest file still has to exist, but it now points to byte ranges rather than different resources. No large number of files on the server. Mid-stream switching to other servers is not easily possible – CDNs won’t like it. Doesn’t work with Web sockets as easily. New approach that vendors will have to grapple with. Since in Chained Chunks we are already doing byte-range requests, it is a short step towards simply dropping the repeating headers and just downloading them once at the beginning for all possible bitrate files. Then, as we seek to different positions in “the” file, the byte range of the bitrate version that makes sense to retrieve at that stage would be requested. This could even be done with media fragment URIs, through addressing with time ranges is less accurate than explicit byte ranges. In contrast to the previous two options, this basically requires keeping n different encoding pipelines alive – one for every bitrate version. Then, the byte ranges of the chunks will be interpreted by the appropriate pipeline. The manifest now points to keyframes as switch-over points. No continuous re-initialisation of decoding pipelines. Multiple decoding pipelines need to be maintained and byte ranges managed for each. We can even consider going all the way and not preparing the alternative bitrate resources for switching, i.e. not making sure that the keyframes align. This will then require the player to do the switching itself, determine when the next keyframe comes up in its current stream then seek to that position in the next stream, always making sure to go back to the last keyframe before that position and discard all data until it arrives at the same offset. There will be an overlap in the timeline for download, which has to be managed from the buffering and alignment POV. Overlap poses a challenge of downloading more data than necessary at exactly the time where one doesn’t have bandwidth to spare. No special authoring of resources on the server is needed. Requires a very simple manifest file only with a list of alternative bitrate files. At FOMS we weren’t able to make a final decision on how to achieve adaptive HTTP streaming for open codecs. Most agreed that moving forward with the first case would be the right thing to do, but the sheer number of files that can create is daunting and it would be nice to avoid that for users.